Rec Boat Holdings employees celebrated their first production Scarab jetboat with the Scarab 195 HO model rolling off the line today at the company&apos;s headquarters in Cadillac, Mich.
Rec Boat Holdings LLC, parent of the Four Winns, Glastron, Scarab and Wellcraft brands, announced its entry into the jet-propelled runabout segment in May. The company announced the rebirth of the Scarab brand as well as new jet models in the 18- to 20-foot range for Glastron, which were introduced last month at the company&apos;s leadership conference. The first Glastron jet, a GT 187 model, will be completed later this week. The new boats are powered by BRP&apos;s Rotax 4-TEC 1503 jet propulsion system. 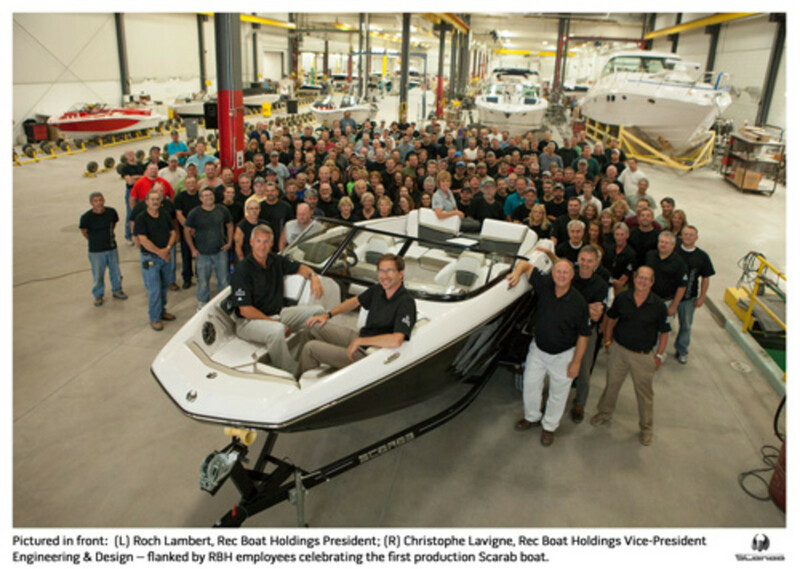 "This new business is very exciting for us," Rec Boat Holdings president Roch Lambert said in a statement. “Our employees responded quite well to the challenge of bringing these new boats to production in a rapid and efficient manner. This new line of jetboats complements our core business very well and provides additional growth and profit opportunities for our current networks, as well as future retailers for our brands." There are three 19-foot Scarab jet models being introduced. The standard model is geared to the entry-level jetboat buyer. The Scarab HO provides a higher-horsepower engine, and the Scarab Impulse is geared to the high-performance market. A marketing campaign will start in early December, aligned with the start of the winter boat show season. The company is recruiting dealers to carry the Scarab boat line. A global dealer meeting is planned for mid-October, during which the entire lineup will be rolled out to dealers and the press. Social media platforms are launching today at ScarabBoats.tumblr.com, https://www.youtube.com/scarabboatstv, and facebook.com/scarabboats.